EMI Music has won an injunction against a US website which it said was selling Beatles songs without permission. A Los Angeles judge issued the order against Bluebeat.com, banning it from streaming or selling tracks by the band and other EMI artists. Bluebeat said it was selling only re-recorded versions of the songs, but the judge ruled it had not provided reliable evidence to back up the claim. The Beatles are one of only a few major acts not to sell their songs online. EMI filed the legal action against BlueBeat earlier this week after it became aware the company was offering unauthorised downloads of Beatles tracks, for 25 cents (15p) each. It also noted many of the songs on the site had never been licensed for sale or replay online. Bluebeat's owner, Hank Risan, has claimed he does not need to license the music as the service is selling re-recorded versions of the songs using a technology called "psycho-acoustic simulation". He argues it enables him to sell music that sounds identical to recordings, making it exempt under a section of the Copyright Act which applies to recordings that "imitate or simulate those in the copyrighted sound recording". Music by tribute bands are typically covered by this section of the law - for example, a Beatles tribute act would not be guilty of violating recording copyright, however they would still be required to pay publishing royalties on any songs they recorded. A court date has been set for 20 November when arguments will be heard from both sides. 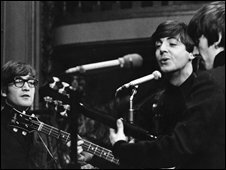 EMI - which owns Beatles recordings - has been in protracted negotiations with Apple Corps, the company set up by the band to look after their catalogue, to agree a deal to sell their songs online. An EMI spokesperson told the BBC: "Discussions between EMI and Apple Corps continue. EMI would love to see The Beatles' music available in digital stores."